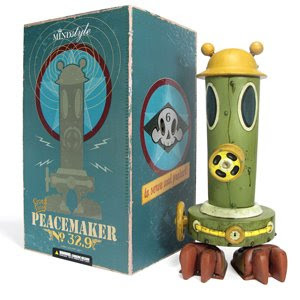 Coming in late March, Brandt Peter's 12" Peacemaker 32.9 figure by MINDstyle is one honkin' huge hunk of vinyl! Preorder yours now! There were only 300 made, so they'll go fast. The Tenacious Exclusive Silver Winstons are now in transit between CA and NYC. MINDstyle emailed us the tracking numbers for the packages yesterday. They should arrive next week, at which point we will begin packing & shipping all preorders. We will dedicate ourselves to the shipment of your preorders 100% as soon as the Winstons arrive. We tried to undersell them as opposed to oversell, so after all preorders are shipped, if there are any left, they will be sold on our new website. ToyQube is hosting it's first art exhibit at the new location, which includes a cafe, show space and toy store. PON will be showing his pigeon artworks. Cool guy, we met him at NYCC. Guy McKinley is an illustrator from the UK. His work is pretty darn cool, he definitely has something special going on. 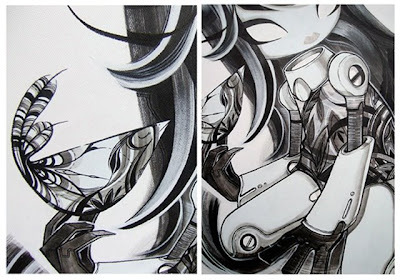 Some of his pieces on the website remind me of the Steampunk art movement in their mechanical intricacies. He's got a show coming up here in NYC at MPH on Friday Feb 27th, 6-9pm. 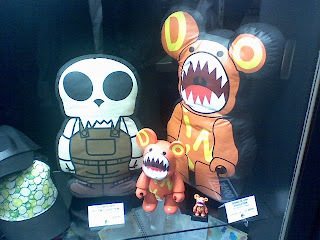 Coming in the spring of 2009 (no exact date yet) is one of the most highly anticipated tokidoki releases yet: Tokidoki Frenzies! 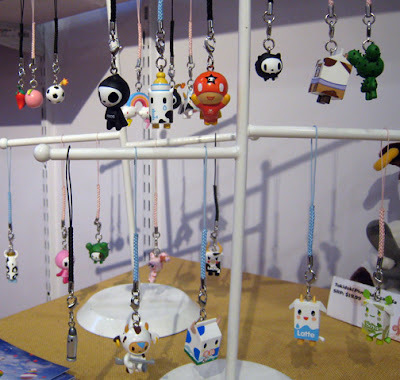 At $4.95 per blind-box, these cute little buggers are the most affordable way to get some Tokidoki To Go. 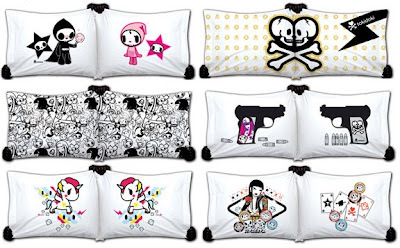 Each detailed little figure is a recognizable tokidoki character that you may have seen in Simone's artwork, on a LeSportSac bag, or in vinyl as an art toy. 22 different designs. We have, so far, sold through an ENTIRE 192-piece master carton just as preorders, which still suprises us! We ordered more master cartons to make sure that we have enough for the demand. The Frenzies seem to be living up to their name! New Tenacious Toys website is live! Will be adding rest of our products to the new website over the next few days. Bunk Bots are soft handmade fleece plush toys that look like robots. It's about time someone started making plush robots! I personally feel that robots have been slandered as metallic and impersonal. This lineup of plushes totally and completely obliterates all of manki... err. sorry. The Bunk Bots are super soft, super cute, and a heckuva lot cooler than the average plush toy. There will be 10 different Bunk Bots: 5 basic designs, each available in "good" and "evil" versions. Each 8" tall 'Bot has a little backstory on the tag, and the whole line has been safety tested. 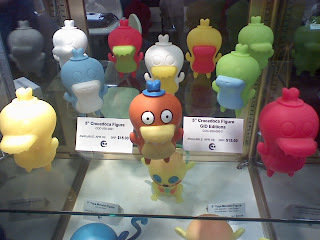 We will have these in stock soon, just ordered them at Toy Fair. 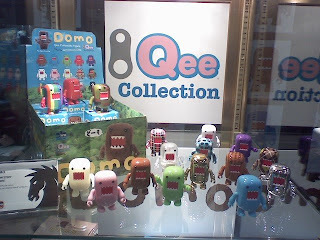 Coming soon from Toy2R & Dark Horse: the 2" vinyl Domo blind-box assortment! Featuring 15 different colorways, including several solid colors, plus camo, plaid, rainbow, wood, spotted and some rare shiny ones! Each Blind box also contains a piece of a Transparent Domo so if you buy enough blind boxes, you may be able to build a whole new clear Domo from the parts you get! How cool is that? Molly Series 1 Qees are sold out. 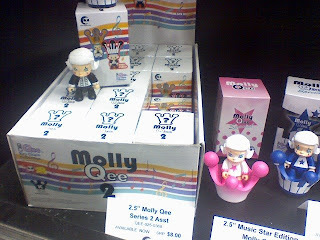 Here is a case of the Molly Series 2 blind box Qees. Crown doubles as a chair for the figures. This is a resurrected Doink Qee pillow that they initally made in very low quantities but they will be remaking to be sold for $30 apiece. Pictured next to an 8" Doink Qee and a Toyer Pillow. This figure is the David Horvath 5" Crocadoca figure, the next figure in the series after Bossy Bear & Turtle. These are the David Horvath Turtle figures: 3.5" Turtle, 7.5" Turtle, and the GID Flocked 3.5" Turtles, one of which will be our Tenacious Toys Exclusive colorway. We may get Pink or Blue as our exclusive, not sure yet. Apparently people loved them the other day at Yoyamart where they were revealed. They will be made in limited quantities of 100 to 200 per colorway. Each color will be an exclusive for a different shop. Of course everyone knows Bossy Bear! The little ones are the 5" Bossy Bears that will come in an assortment pack that we may pick up. In the back is the big 8" Bossy. See that cool looking Bossy in the back that looks like wood? There will be a whole series of smaller Qees with the wood-color paint effects! Other items we ordered: Sun Min Spider Boom vinyl mini figures, Jeff Soto 8" Egg Qee Minnesota colorway, Kozik 1.5" Mini Bombs, Dalek Space Monkey Qee assortment. 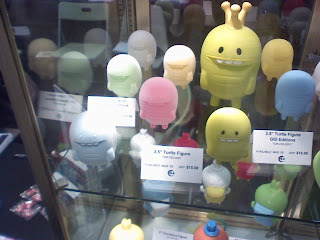 Also possibly Voltaire's Deady Qee Assortment. ...we are working out little butts off over here at Tenacious Toys, trying to get our new & improved website up & running. One aspect of the new Tenacious Toys site is this blog, which we will link to from our new homepage. The purpose of this blog is to keep you informed about what's going on in our store, without having to shoot off newsletter emails every day. We will be posting up info about upcoming toys, artists, pics and info about anything else related to our shop. We have been talking about switching hosts and putting up a new website for a while now, and we finally got the time to get that big project done without the help of outside designers or programmers. Okay, almost done. We will most likely end up launching the new website this upcoming week. It's a lot of work, especially with our old website still up & running, orders to fill and 3 trade shows in NY this month. Whew! Benny is off the Toy Fair today to scope out new toys and meet with vendors. In particular we are going to finally meet in person the distributor that is handling the fulfillment of our orders from Toy2R USA! So in the upcoming months, expect more Toy2R products at Tenacious Toys. And with that, we're off! 2" vinyl Domo blind-box mystery figures!